I'm back with my last installment in my updated What's In My Kit video. I hope you all have enjoyed these videos and found them helpful. The last video features something super important that all Makeup Artists should own - a Makeup Light and Chair. Check it out! 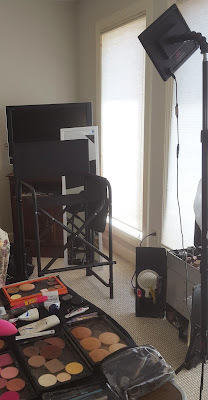 I've been doing makeup for 10 years now and have been through a lot of chairs in my life. They are super important because you need your clients to be at a comfortable height so you're not stopping over and killing your back or standing on your tippy toes for hours at a time. 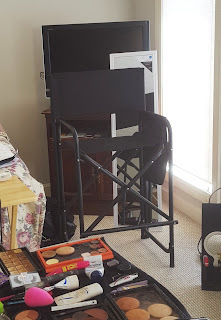 First I had the traditional director's folding chair. The wood base was too heavy to carry to gigs and cumbersome to hold. Then I bought a really nice adjustable salon chair. But that was definitely not portable. It had to stay in my studio. I still needed something to travel with. I find that many of the Makeup Artist Chairs are too expensive. The camping chairs are not tall enough. So I found a compromise. Get a Trade Show exhibition chair. 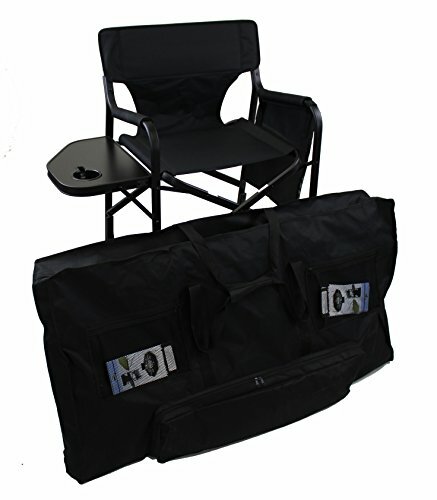 It has all the qualities you need - lightweight aluminum frame, bar height at 30inches, and easy to fold up and carry. My favorite feature of my chair is that it comes with a carrying case so I can easily throw it on my shoulder. It makes a difference when you need your hands to roll your kit and the other to open doors and press elevator buttons. Unfortunately this bag is currently unavailable on Amazon but keep an eye out for it or something similar to go back in stock. In terms of lighting, again I've been through it all. 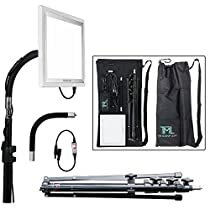 If you're a traveling MUA, lights are so important because you never know what kind of bad lighting situation you may be in...from a dark hotel room or in a random warehouse on set, who knows! Your makeup can turn out totally wrong if you can't see what you're doing without a proper light. I hope this was helpful! Stay tuned for an amazing Makeup Kit giveaway coming soon!